Discussion in 'Thumpers' started by cyborg, Apr 24, 2012. 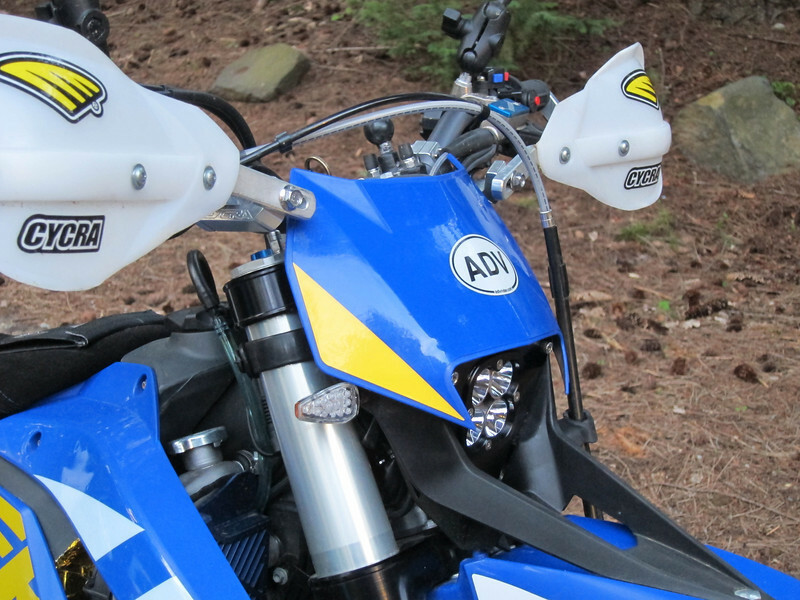 As anyone with a -09 to -11 Husaberg FExxx knows, the 35watt headlight on these bikes is a joke, downright dangerous at night if you actually dual-sport the bike or try to ride tougher trails offroad. 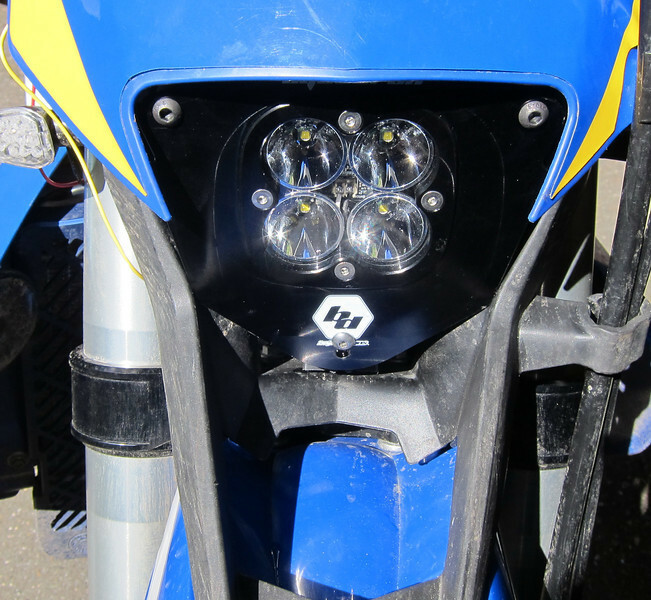 The FE 70degree bikes have 210 watts to play with so I started looking at the latest tech, looked at the HID dirtbike units and decided I wanted to try LED lights. 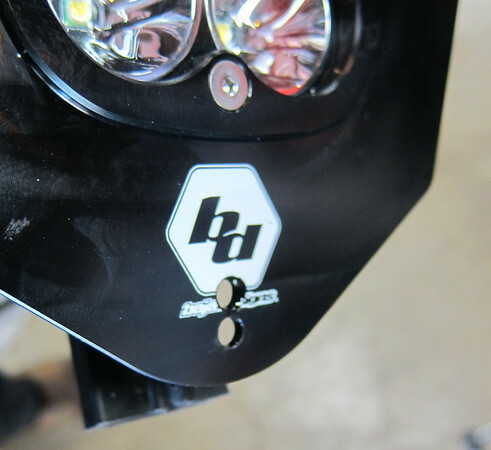 There are getting to be more great products in this category, but a friend pointed me at Baja Designs new 3600 lumen, 45 watt Squadron LED race light. 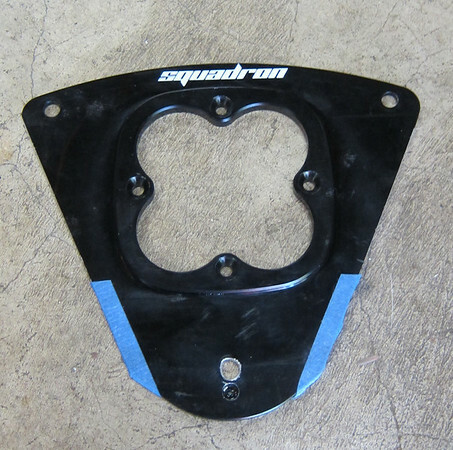 I happened to have a Dakar supporter discount coupon for Baja Designs so I took the leap and got the Squadron in the Polisport mask, the only option available at the time. 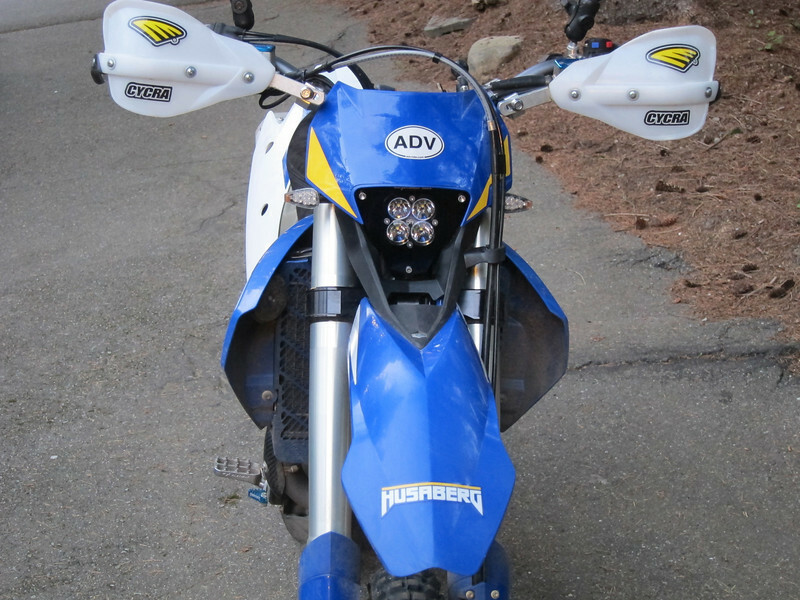 When I got it, I decided I didn't like the look of the Polisport mask on the 'Berg and wanted to find a way to mount the Squadron in the OEM Husaberg mask and keep the lines of the bike the same. 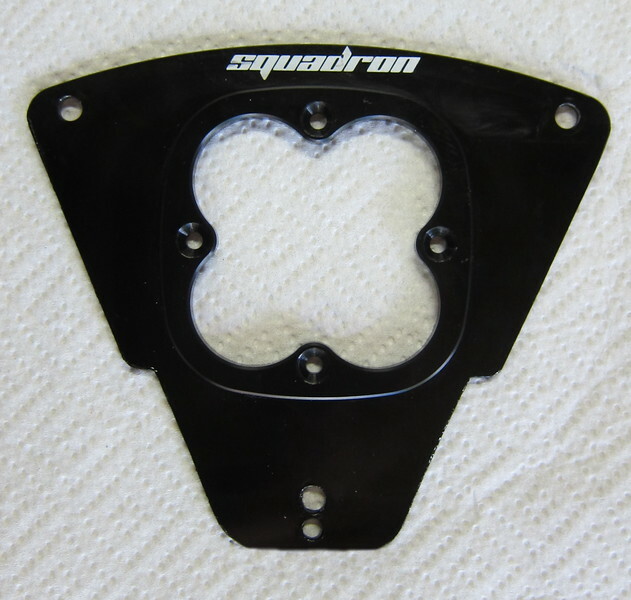 The Squadron 3 x 3 is pretty small after removing from the Polisport mask and metal flange. 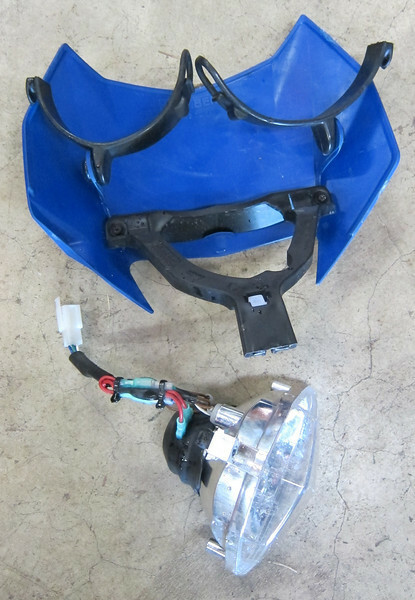 This is what the Husaberg mask looks like behind, with bulb socket removed. Not a lot of room to work with. 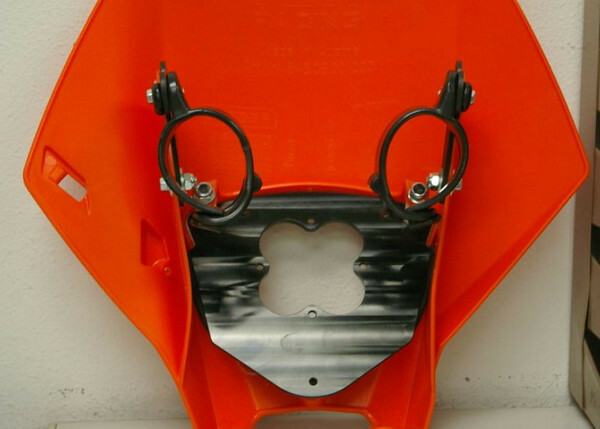 and was just about to fab it up, when Baja Designs announced they were offering a kit to retrofit the the Squadron to -05 to -07 OEM KTM's masks. 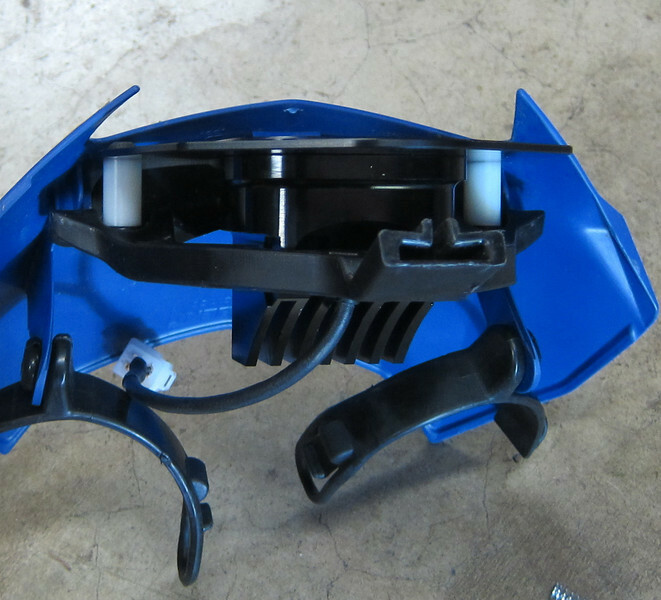 I was particularly interested in the flange used in this kit. 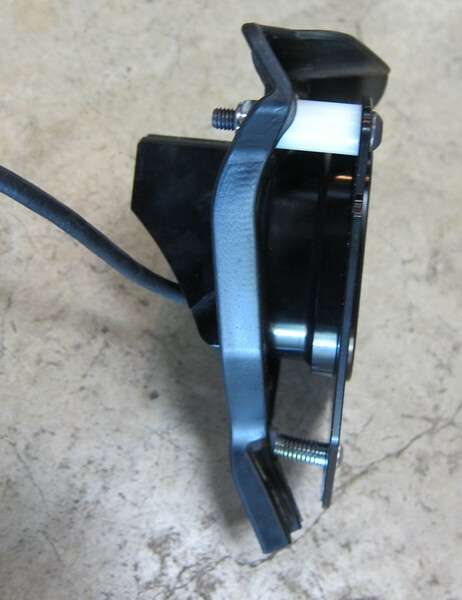 The flange looked pretty close to my design, and the great folks at BD made the just the flange and mount hardware used for this kit available for purchase. 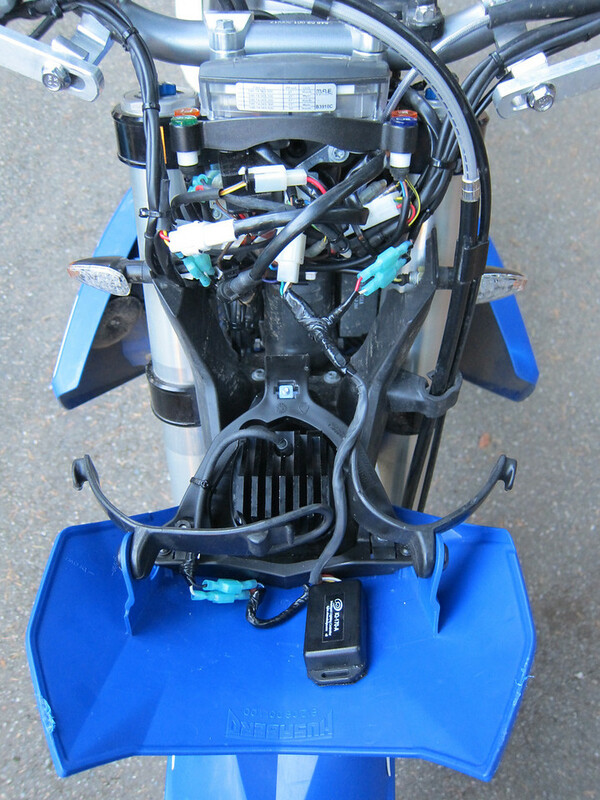 This is what I received in the BD kit, along with my OEM Husaberg mask and light frame, and the Squadron from my Polisport kit. Some of the hardware in this kit I didn't need, like the foam and brackets. It was the flange I wanted. 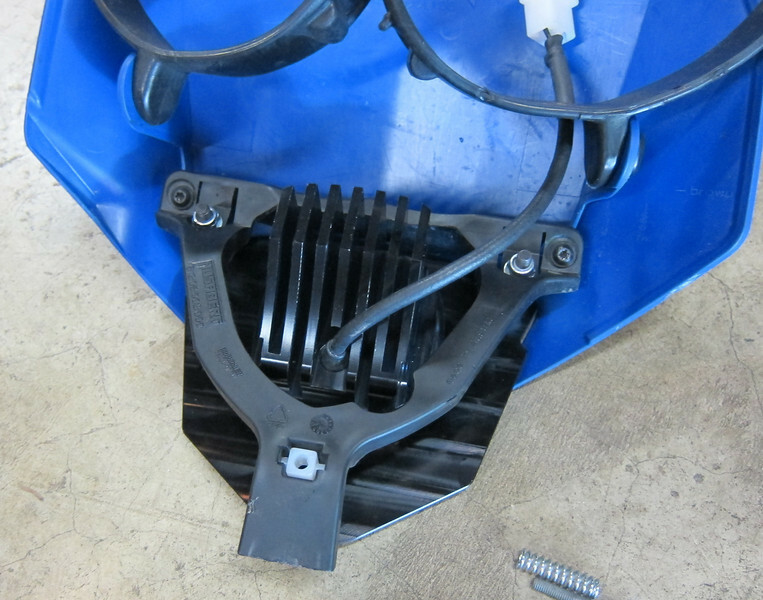 The initial mounting using the supplied nylon spacers, so far so good. 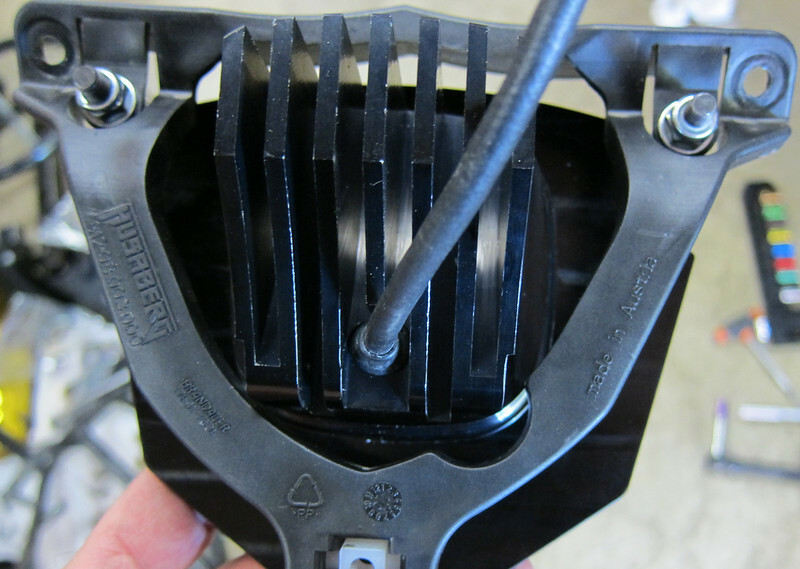 Hmm, the OEM plastic headlight frame on the bottom right blocks the Squadron from moving backwards for beam adjustment. All better now. Subtle but just what was needed. Then discovered the beam adjustment screw in the new flange was too low to match the Berg's frame, so had to drill a new 13/64" hole a little higher. 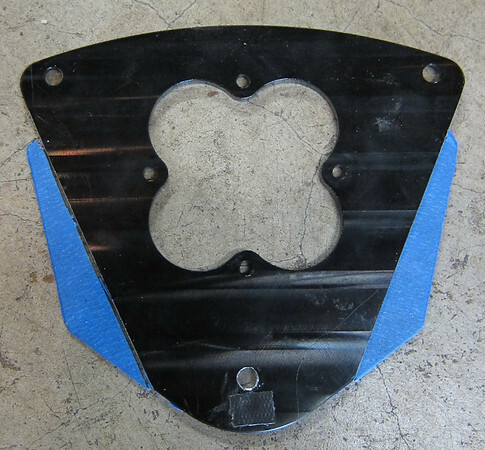 OK, time for first fit... Argh, no go, way too big on the sides to allow the flange to move back. Looks like more mods needed. Good thing aluminum is easy to cut and drill. Sorry BD, the logo silkscreen chipped off very easily during the bandsawing. Now to fit it up! 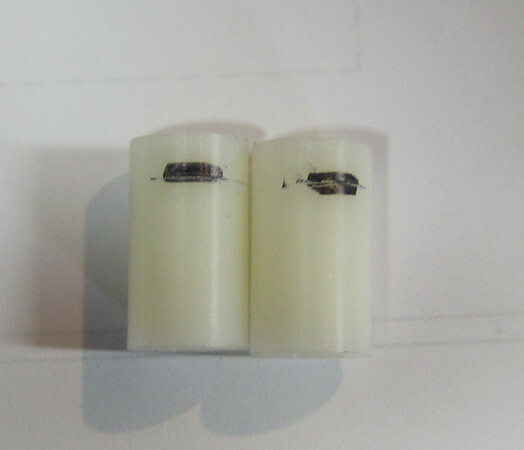 Needed to cut down the supplied 22mm tall spacers to 17mm to get the proper flange angle. The nitty gritty electrical install on the back. 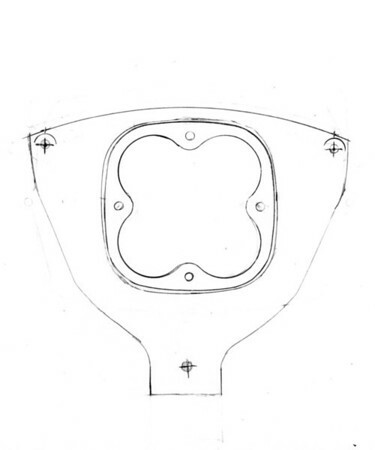 Note the tiny Skene Designs IQ-170A dimmer. This allows me to program any dim setting from 0% to 100% using the high beam switch and has a High beam override wire also run by the high beam switch. The "A" feature also has a "Alert" mode which flashes a full power pattern to really wake up motorists at crossroads, etc. 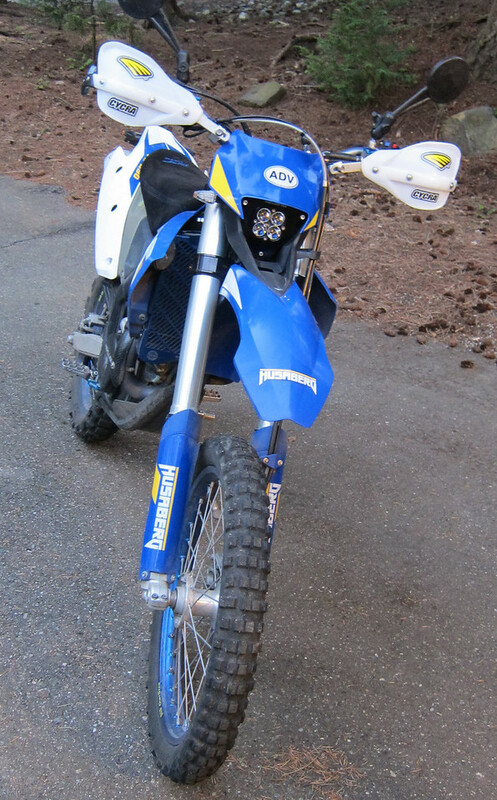 Worth the extra $20 to me, since a dual-sport dirtbike is even hard to see on the road. 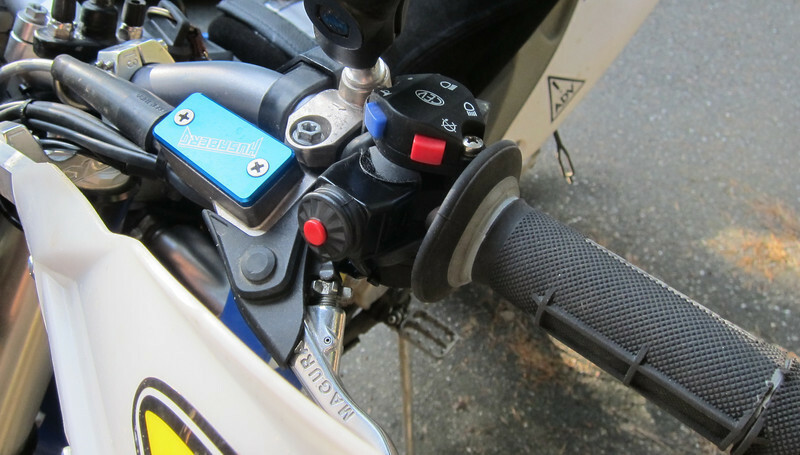 I used a KTM starter pushbutton I had laying around to give me a better High beam instant flasher, and it works in conjunction with the regular headlight switch. Cobbled it in there. It fits, and it works perfectly! IMHO it fits the look of the bike pretty well. I'm happy with it. The night test was awesome, this light is SUPER bright, too bright for paved road traffic, and the dimmer works perfectly to keep the oncoming cars happy. I'll post a few nighttime pictures and vids soon. Excellent. Thanks Cyborg, i have been interested in this light since I saw the release. So are you saying that with the dimmer it is suitable to use as a replacement for street use (I understand its still illegal)? Is there a shield over the LED's? I couldn't tell, between bugs and mud clean up might be a challenge. Yes there is a 3 x 3 polycarbonate cover over all 4 bulbs, it's just very clear. Replacement covers are a few bucks at BD I'm told. 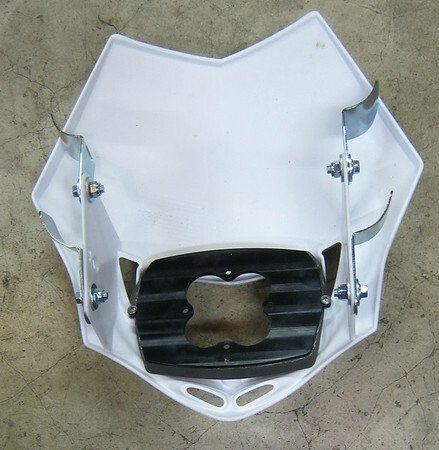 I saw where some have added yest another mud guard shield in from of that, but I'll try running this light just like it is. 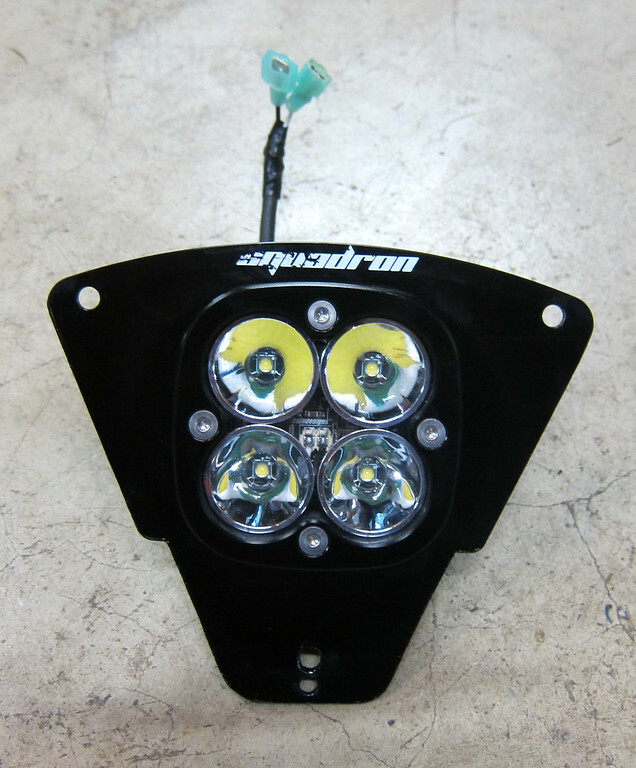 Yes I would say with the dimmer it's very acceptable for street use, especially compared to all the glaring HID's cars and bikes run. At the programmed Low Beam setting, it's still plenty of light to ride in traffic with and I don't get irritated flashes from oncoming cars. Already ridden past a few local police cars during the day and night and no issues. 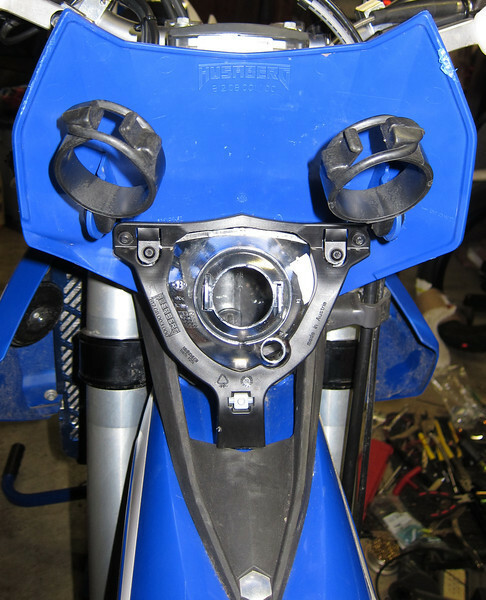 When it opens up, hit the High beam - Oh Yeah! 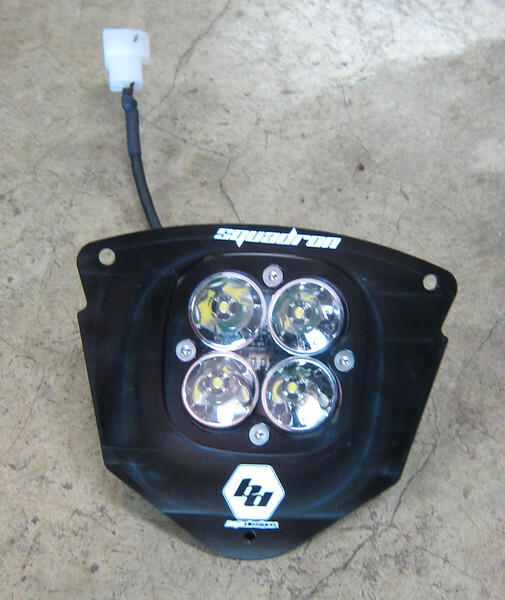 Is the light you purchased in the Squadron the same as The OffRoad Light Spot or the Off Road Light Driving setup, any idea? Or maybe a mix of both? Gordon said it's the "Driving" version, and it does look that way, better spread. I like what you did. The end result looks very nice. 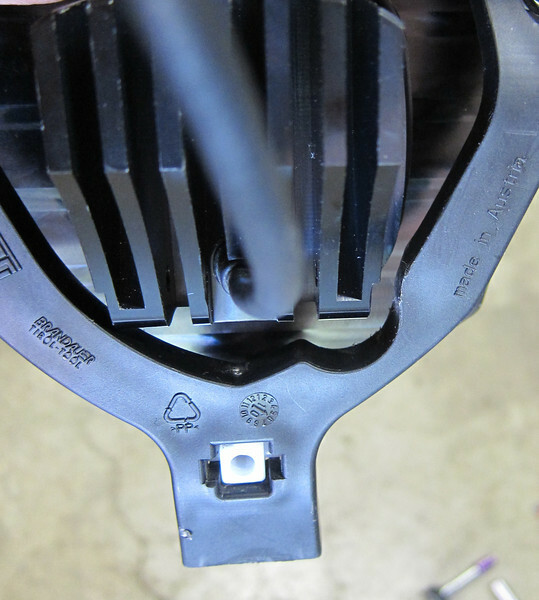 What power setting did you end up w/ for the low beam? I just want to blame you for causing me to spend more money!!! I just wanted you to realize this! Great write-up Cyborg . Glad it all came together for you. I'm interested in doing a similar set-up and have a question for you. 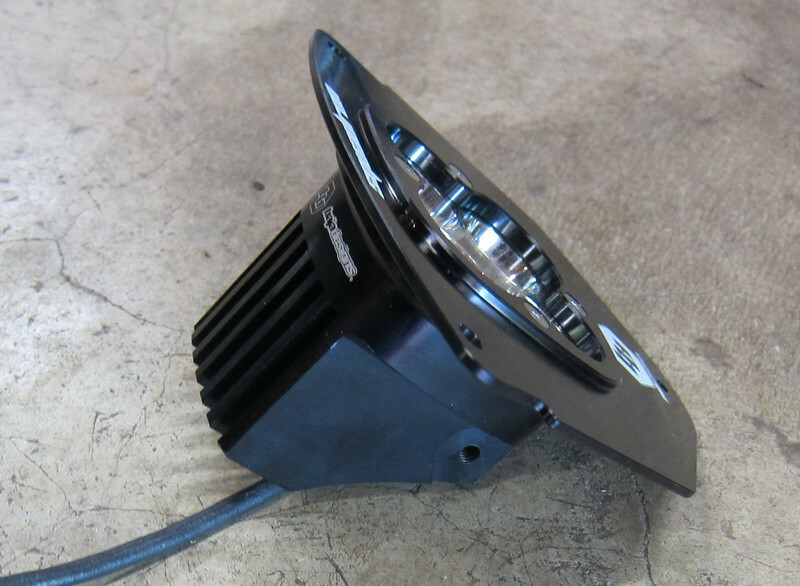 Are you using the Skene IQ 170 in addition to the BD dimmer or the Skene dimmer by itself? 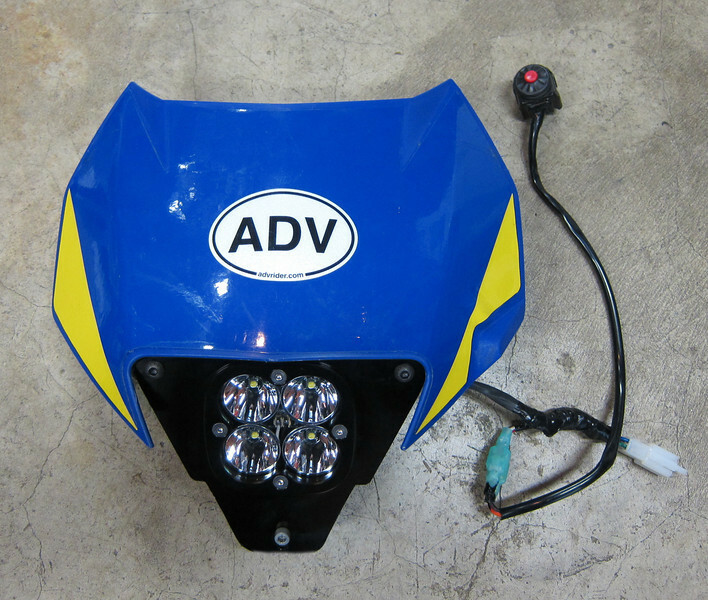 If the Skene by itself, were you able to wire it into the CEV switch cluster and have the CEV switch cluster control the light and high beam function? 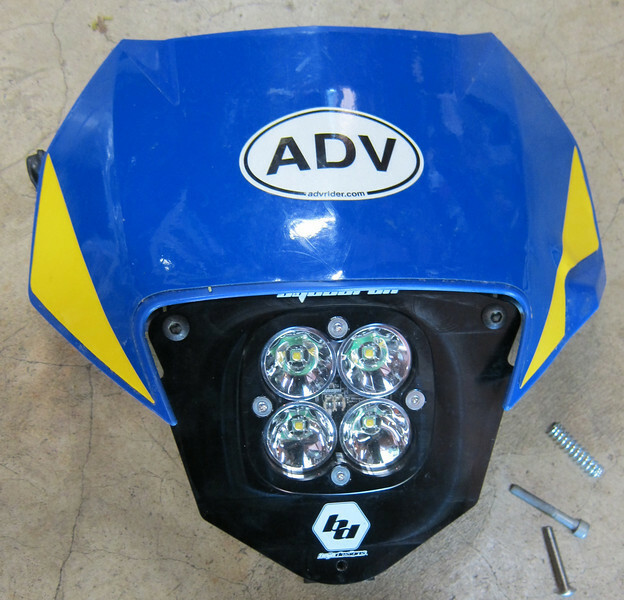 We came up with those same mods while installing the lights at base camp at 4500 meters. 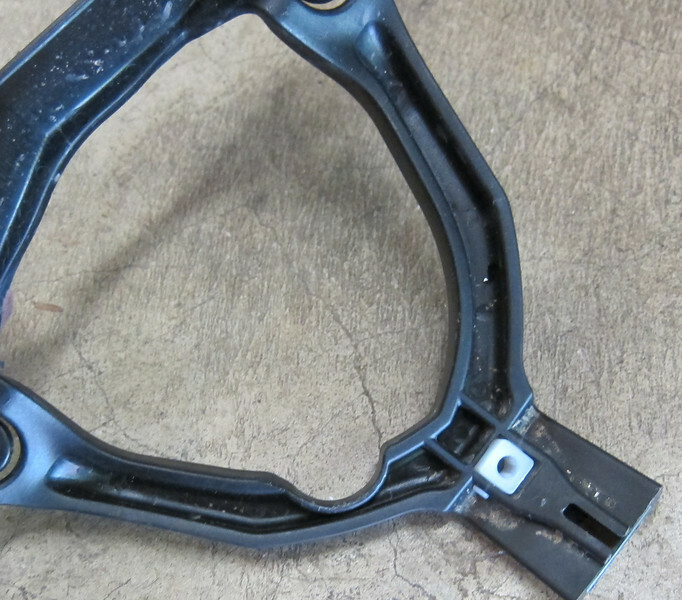 No band saw to modify the aluminum plate so I used the Leatherman to cut off the plastic side supports that are used for the indicators, then the flange fits. 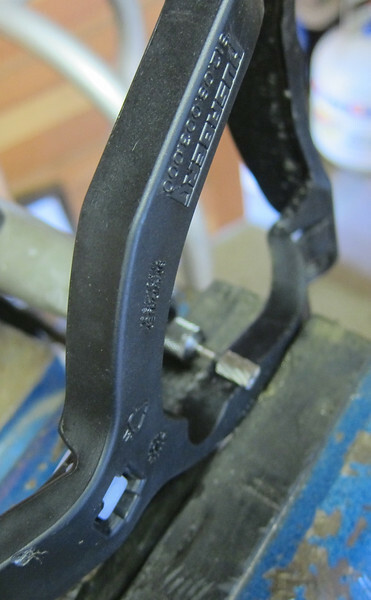 I do like your solution a lot though, hopefully BD will start making a proper adapter plate for the Bergs? Good write up cyborg ! I realize you started your project before BD was finished with their development work, but I take it that their Squadron replacement for the earlier KTMs and Bergs would need the same mods to it that you ended up doing ? 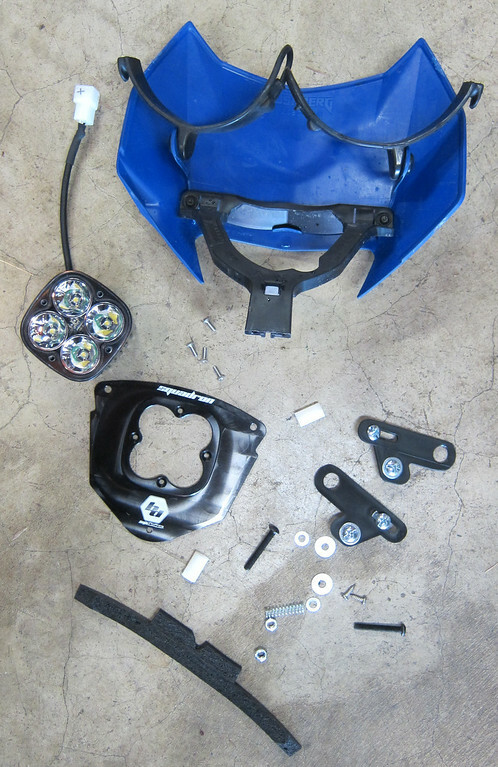 I didn't want to cut any Berg plastic and wanted my flange to fit as well as the OEM headlight. 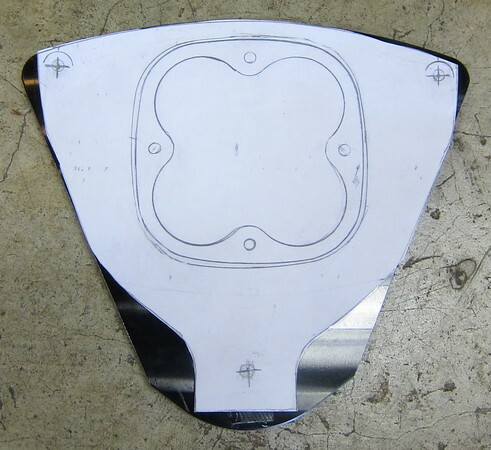 I have the traced flange pattern now, just not in CAD yet. Happy to give that to BD. Your mountain trip was truly EPIC/FANTASTIC/BRILLIANT! Baja Designs Enter: "BDForums" for 10% ADV Discount! how was the ride in South America? I did this test for the BD Squadron thread, and thought I'd post it here too. I ran a test of current draw on the Squadron when I got home after work today. I have a test setup that makes it easy to do with a very accurate DC amp meter and an inline fuse adapter I made. 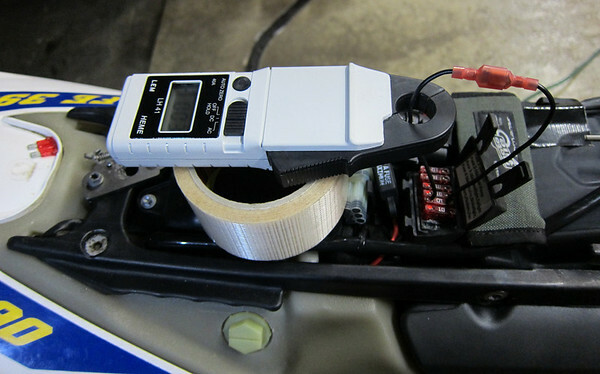 I just hooked up to the headlight circuit (Fuse 3) and ran it through 0% up to 100% with the Skene Deseigns dimmer, which is programmable in brightness range: 0 to 100% in 10% subjective brightness increments. My current "Low Beam" setting is 50% = ~11W. 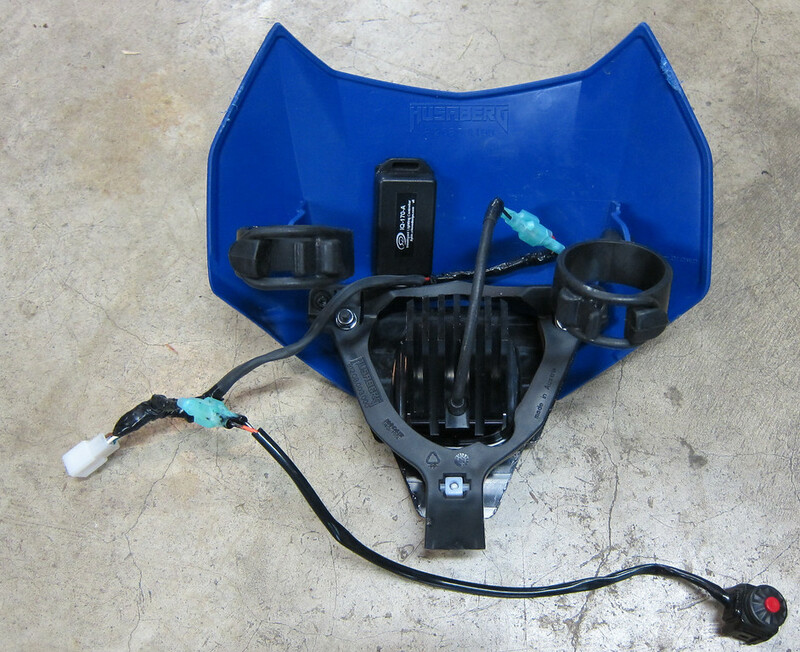 ** The inexpensive generic e-bay dimmer does not have the optional High beam/full-power bypass wire, that allows the regular High-beam switch to toggle on full-power, with the Low-beam setting being the dimmed level. The other 3 dimmers have that feature. That feature could be added with an external relay on-the-cheap if you are good at DIY. 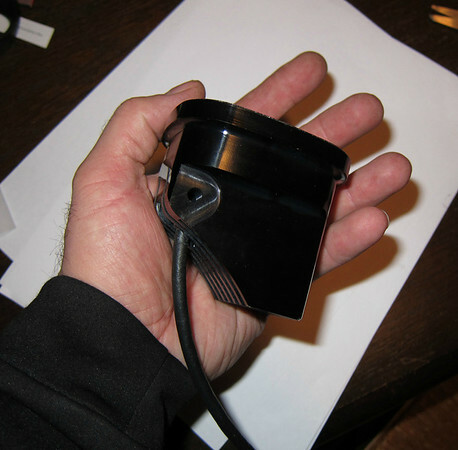 The e-bay dimmer also isn't waterproof. Awsome info and good to have. I found that the low beam setting @ 30% +/- is OK for not blinding oncoming traffic at night, but a bit low for forward visibility. Conversly the 50% setting is fine for visibility, but too bright for oncoming traffic at night. 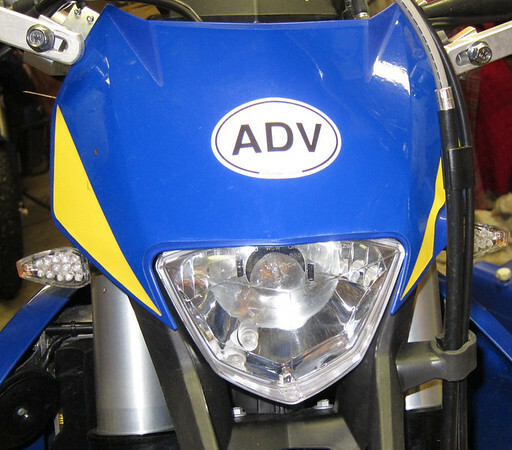 Just try standing 30-40 feet in front of the bike w/ the dimmer at 50% and see how bright it is. Yeah did that just today, during daylight hours, another friend and I, for comparision. 30% to 40% is bearable, 50% and it starts getting painful for the eye, but surprisingly cars aren't flashing me at night, so I must have it aimed low enough. If they do flash me I can pop High on for second "see I AM in Low!" Any longer than just fast flashes and they would be seeing spots and get dangerous to me or others around them! Cyborg - hats off to you for some valuable info and insight. Very much appreciated. Just out of curiosity what actions are needed to set-up the Skene dimmer for 50%?